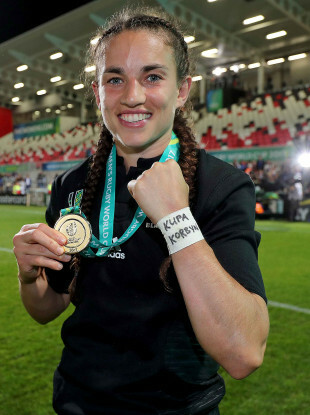 Fullback Selica Winiata celebrates World Cup victory in Belfast. THE NEW ZEALAND Rugby Union today confirmed the 28 women who have been awarded professional playing contracts for the 15-a-side Black Ferns. The group set to earn a salary of up to NZ$45,000 (€26,500) includes 17 of the squad who won the World Cup in Ireland last year. Among them is the veteran Fiao’o Faamausili, who had planned to retire after playing in a fifth World Cup and focus on her day job as a police officer, but has been included to lend her experience to a youthful group. “We are thrilled to offer Fi a contract. She is as fit as she’s ever been and is super passionate about being involved,” said Black Ferns coach Glen Moore. The NZRU’s announcement today stresses that the one-year retainer (due for renegotiation in 2019) does not guarantee game-time and that two additional contracts could be awarded after a 48-woman training camp in June. On top of the 28 professional 15-a-side players, New Zealand have around 20 players contracted to play Sevens rugby – including stars of WRWC 2017 Portia Woodman and Kelly Brazier – who will continue to be eligible for the 15-a-side game and the assembly/training fees that involves. “When you think that there’s going to be 50-odd girls being contracted to play rugby – it’s pretty awesome,” scrum-half Kendra Cocksedge told Stuff.co.nz today. Email “17 World Cup winners among 28 professional contracts for New Zealand women”. Feedback on “17 World Cup winners among 28 professional contracts for New Zealand women”.